SSPX priests and faithful lead the way in Catholic Action in Ireland. RELIGIOUS protesters prayed at the gates of University College Cork (UCC) for the second day in a row yesterday as a controversial image of "Our Lady of Guadalupe" went on display on campus. Mexican-born artist Alma Lopez’s digital print was among 12 of her art works displayed on the second floor of the Rahilly building as part of an academic conference on Chicano culture — US citizens of Mexican descent. The exhibition sparked controversy earlier this week after the Bishop John Buckley of Cork and Ross described the Our Lady image as "offensive". But it attracted a steady stream of visitors throughout the day. Most dismissed the controversy and urged those protesting outside to open their minds and visit the exhibition. The group of some 20 or so men, women, children and priests who braved the rain to pray decades of the rosary at the university’s main gates, refused to view the image. They held placards denouncing it as blasphemous and distributed literature to passersby. 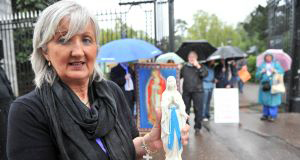 Mary Wrenne, from Ballincollig, Co Cork, clutched a statue of the Virgin Mary and vowed to continue her protest tomorrow. "As a woman, I am offended by this image," she said. "This exhibition is extremely disrespectful to the Mother of God." Fr Francis Gallagher, a member of the Society of St Pius X, travelled from Athlone to join the protest. "This is very offensive to Catholics. I am here to protest what I would consider to be disrespect towards the Mother of God," he said. "Having her dressed in an immodest way gives a bad example." He said UCC authorities should have cancelled the exhibition. "We have artistic talents because God has given them to us and we should use them in some way to glorify God. "What this lady is doing certainly doesn’t do that. It’s not art — it’s some kind of gimmick." Joe O’Connell, from Cork, who said he was a member of the Fatima Centre Ireland, said he has asked the gardaí to investigate whether the image was blasphemous. John O’Callaghan, from Cork, said he has written to the President of UCC asking him to resign. "Our Lady has always been held in great esteem by the Irish," he said. "But this exhibition is insulting and demeaning to all our histories." A member of UCC’s Atheist Society supported their right to protest but criticised their stance, and the current blasphemy laws. "We believe that religious and nonreligious people alike should be protected from harm, and incitement to harm, but religions, just like economics and politics, should be open to criticism," a spokesman said. Ms Lopez said the image does not represent the Mother of God and was never intended to offend. "I never intended to offend, desecrate, blaspheme, or disrespect anyone’s religious beliefs with this image," she said.